Reading this MSNBC article entitled “Narcissists make bad leaders; here’s why” made me think about leaders in the churches exhibiting the same characteristics. Although narcissists have leadership-related qualities, such as confidence, authority and high self-esteem, their self-centeredness ultimately prevents them from partaking in the creative exchange of information and ideas, which is crucial in group decision-making situations, the researchers at the University of Amsterdam said. Narcissus by Caravaggio. Narcissus gazing at his own reflection. It makes perfect sense. Though narcissists are often charismatic, charming, assertive, confident, and seem like the perfect candidates for leadership, this study concludes what the scriptures have known all along about the conceited arrogance which blinds them from making decisions which are best for the group, and in this case, the body of Christ. An experiment in the journal of Psychological Science, took 150 people and placed them in groups of 3 to choose a job candidate, where one person in each group was assigned as the leader who was ultimately responsible for choosing the candidate. They shared unique information with each participant about the candidates as well as common information with everyone. If all information was shared with the group in the decision-making, they would choose the right candidate for the job. Participants also indicated how much information they knew, indicating the level of sharing that went on in the group. GUESS WHAT? The persons who were tested and shown to be the biggest narcissists, all chose the WORST CANDIDATE for the job. “The narcissistic leaders had a very negative effect on their performance,” study researcher Barbora Nevicka said in a statement. “They inhibited the communication because of self-centeredness and authoritarianism.” But despite their poor performance, group members rated the most narcissistic leaders as the most effective. “Narcissists are very convincing,” Nevicka said. Narcissistic Personality Disorder (NPD) is a condition that is characterized by an inflated sense of self-importance, the need for admiration, extreme self-involvement, and lack of empathy for others. Individuals with this disorder are usually extremely self-assured, proud, and arrogant. They expect to be noticed as superior to everyone else. Many successful individuals may be seen as narcissistic, but this disorder actually disables an individual to function in a healthy manner in society and can cause great harm to those who love them if they interfere with their narcissistic supply. 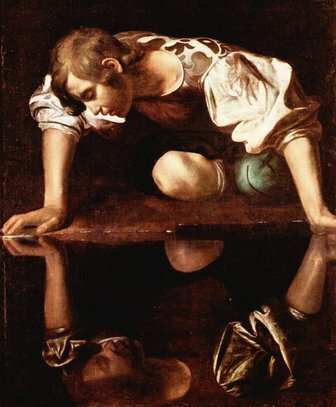 Narcissus, while being the mythical figure for which NPD is named, really reflects those characteristics of that ancient serpent, the Devil himself. Satan in his arrogance and conceit wanted to be like the Most High God, and his rebellion is well documented in the scriptures. Those who are in the flesh often exhibit these tendencies as well, so we must ALL guard against narcissism and things which feed those tendencies in our Christian walk. If anyone has been part of an abusive church where charismatic leaders who exhibit narcissism have been present, these findings are not surprising at all. The issue with narcissists is that it matters not to them how they feed their narcissistic supply, whether they are loved or feared, whether they seek love through positive relationships with the people of God, or by authoritarianism and intimidation. They put up a “very convincing” front that they are effective spiritual leaders, but in reality, these hirelings are simply looking to fulfill themselves, and care nothing for the flock of God. There are many narcissist personalities amongst us who have crept in unawares in pulpits today, projecting false authority, and the appearance of having things all together, but in their arrogance, they suppress all communication, sharing, and criticism from their congregations. Demanding accountability and dissenting against their authority will result in a narcissistic leader doing anything to keep that false air of confidence and power. They will destroy and scatter the sheep, and use controlling manipulative doctrines to do it. Like it was quoted earlier, their self-centeredness blinds them to the needs of the people they are supposed to be leading to Christ, mainly because they have created their own world (usually their own church building, structure, etc.) where they are preeminent in all things, and everyone else must bow, or suffer the consequences. Concerning Controlling Narcissistic Pastor/Leaders, if there is a spiritual leader amongst you who exhibits many of these characteristics, tread very lightly with them, for these people because of their insecurities will try to destroy you emotionally, spiritually, physically etc. They will use scriptures out of context, they will guilt trip you into thinking you are disobeying God if you do not submit to them, they will induce trauma and indoctrinate with numerous improper fears and phobias aimed at keeping you reeling in diffidence and an over-dependence or co-dependence on them, and will not stop till they have satisfied themselves. You have to guard your heart because people like this, do not care about you, or the God you serve or His sheep. Thanks for this post! I worked at a church like this until I was let go last year. The part you wrote about how they create their own little world was spot on. The associate pastor and his wife were the main problem there. They lost so many of their staff it wasn’t even funny. They had their own vision of how they wanted things to be. They wanted their own kingdom & anyone who was seen as in the way or a “troublemaker”(basically anyone who could see through them) was outed. They were kind to you only as long as you had something to offer. Anyone else outside their 4 walls was a nobody-they could care less about you. Once you saw through them, your days were numbered. I was let go after violating the unspoken rule of not exposing any issues that were going on, namely the bullying of some of the staff members by the leadership. Their arrogance was sickening. I witnessed things such as shunning and asking visitors to leave during worship services because they were not “properly” attired or had the wrong hairstyle. Sad thing is, they really do think they are doing right by God & see nothing wrong with what they do. They put on a very innocent & humble front that can take years to discern. Glad I’m no longer there! What a great article . I have just left a church for this very reason. I have been hurt by a minister who will not admit any wrong doing and somehow it is seen to be my fault. This person may ‘look good’ on the outside but when confronted got very angry and showed no compassion for hurting myself and others. Thank you for confirming what I intuitively felt was true regarding this person in a position of leadership and authority. I was so happy to read this article. I could not understand how our church could end up with such a person as our Pastor. I was on the Pulpit Committee who recommened him to our church and I have been depressed every since. Our church had a sizable bank account when he came now we sturggle to pay the bills. When the Deacons considered removing him he went on the defensive and had all the Deacons, Trustees and anyone else he thought was a threat to his position removed. He has a core of people around him now who do his bidding. It’s really sickening. A lot of the members left the church and I am on the verge. Thank you for the reply Pat. I’m sorry you had that experience. However I am glad that God in his mercy gave you the wisdom to leave and the time to heal. God bless you as well.